The ZX Series is the solution for driving today's Enthusiast and gaming systems. It has the ability to easily power both NVIDIA SLI and ATI CrossFire modes, supporting even the most power hungry GPUs with multiple GPU configurations. 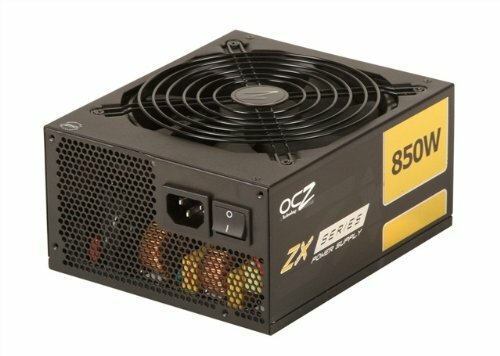 Industrial-grade yet designed with enthusiasts, gamers and modders in mind, this PSU is stable, robust, and sports a sleek look and the most compact form factor of its class. Kept ultra-cool with a load-controlled ultra quiet 140mm fan, the ZX Series was engineered to be the quietest PSU available and eliminate distracting noises from your PC. Highly efficient, featuring up to 92% efficiency at typical load and up to 89% at full load, this leading-edge power supply remains rock solid and powerful while retaining superior efficiency under load. The OCZ ZX Series provides universal Input and Active PFC (Power Factor Correction) to effectively regulate input voltage across worldwide power grids and maintain an economical, stable supply of power.